I believe I followed an errant Facebook/skype/ popup which produced multiple tab openings. Now, I receive an error message from Avast saying "10050 error". I cannot update my Avast, nor does my system recognize the internet even though I am connected directly via ethernet cable. The "Network Connections" tab indicates I am connected to our local server but no data is being transmitted. When I try to repair the connection, an error occurs indicating - "That option is not possible [I am paraphrasing because I do not recall the exact wording], Contact your administrator". There is a great deal of text to follow that "Unhandled exception" error box, so I can upload in another post a picture of that text if you need to see it. This topic has been reopened at user's request. The topic has been reopened per User's request. Logs from DDR and Avast scan. I believe your directions requested they be zipped - so I zipped them. I am still having problems connecting to the internet after running both programs. Windows recognizes the WiFi router signal, but it does not connect. This problem occurred prior to running TDSS and Combofix also.
" Sentinal RMS Development Kit License Manager encountered a problem and needed to close." I also still get the "Unhandled exception!" error. Now there is an entire list of items under stack trace. If you want me to send you a picture of that I can attach it also. Are you able to burn Cds and have access to a Usb Flash drive? You may have corrupt critical system files. Let's see if we can fix that. Type in sfc /scannow in the command window and press enter. If any files require replacing SFC will replace them. You may be asked to insert your Windows XP Disc for this process to continue. This can be done with a borrowed Disc if you don't have one. Be patient because the scan may take some time. 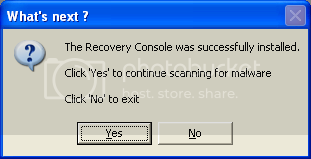 Allow the scan to run and when completed, reboot the system.